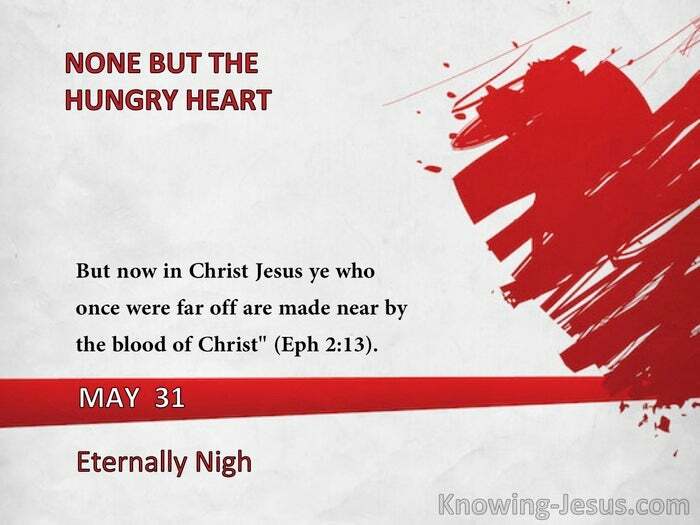 But now in Christ Jesus ye who once were far off are made near by the blood of Christ" (Eph 2:13). Until we know our position in the risen Lord Jesus, we can never really face up to the sinfulness of our old nature. But "hidden with Christ in God," we can both face up to and face away from the old, "looking unto Jesus, the author and perfecter [marg.] of our faith" (Heb. 12:2). "God sets me in nearness to Himself in the Lord Jesus; and as I learn my nearness to Him, I am prepared for the exposure of my natural distance from Him, and I am, through grace, morally apart and sheltered from it (Rom. 8:9), at the very moment when I see it. The greater my height, the greater the enormity of the depth appears; but I am safe from it. As a consequence I rejoice in Christ Jesus, and have no confidence in the flesh' (Phil. 3:3)." "Two things mark spiritual growth; one is a deeper sense of the sinful old nature, the other is a greater longing after the Lord Jesus Christ. The sinfulness is discovered and felt as the power of the Holy Spirit increases; for many a thought and act passes without pain to the conscience where the Lord Jesus is less before the soul, which will be refused and condemned as the knowledge of the Lord increases in spiritual power within." -J.B.S. "When the Lord Jesus Christ is enjoyed, things unlike Him drop off like fading leaves." 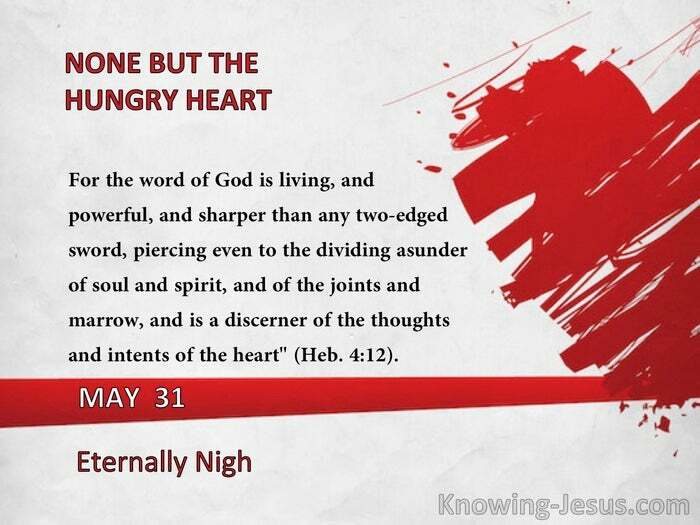 "For the word of God is living, and powerful, and sharper than any two-edged sword, piercing even to the dividing asunder of soul and spirit, and of the joints and marrow, and is a discerner of the thoughts and intents of the heart" (Heb. 4:12).